Whew....Thursday already, a few more days and both the boys will be out of school. It's hard to believe both boys will be in High School. They have about week off before Summer School starts up - both are taking classes to get ahead with their credits. Seems the school keeps adding more mandatory credits, but the day doesn't get any longer, so it's either Summer School or Zero hour to stay a step ahead. Joe graduated yesterday, so I used this weeks challenge to create a card for him. I used a SAMJ to stamp the sentiment in Blue, then added some stitching using the Drywall Stitching Technique. Thanks for stopping by, be sure to click the Three Clovers Logo on my sidebar to see what Kerry and the other Challenge Members created today! great card, and handsome man!! Can't believe they are going to summer school to make up credits, that's crazy! Very beautiful card! I love the blue color and shape so much! Fabulous! 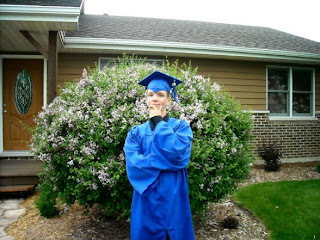 Love the colors (the High School I graduated from was Royal Blue/White) - Congrats to your son and Kudos to the others for getting a jump start on HS Credits. The colors are awesome and I love that embossing folder. I didn't even know it existed. I love this Lisa! And it reminds me that I got that Number folder and used it exactly once. Wish I had thought of this when I had a graduation card to make Tuesday night. Dang! I love what you did with this. 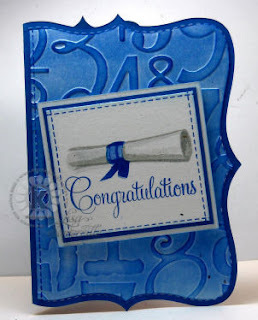 Perfect card and I see it matches his grad gown perfectly!